Quick question... Is there any way to create asymmetric loops in Gadget, like in Patterning or Elastic Drums for example? It seems each clip has to be an even multiple of the time signature. You can use different time signatures, but I think that's a global setting, not per scene.... But if not, that's one way to do it. Think the answer is no. You can do an uneven number of bars though (just not steps within a bar). 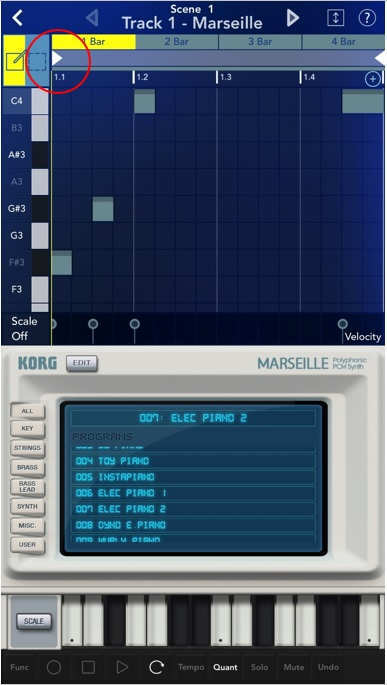 Don't know if anyone has even requested this over at the Korg Forums? (I'll wait for the 3.0 release of Gadget before I spend more energy on typing down more feature requests as I'm interested to see how much of them actually end up in the next release). I know my Electribe 2 can do this. The length of each part can be set independently. Separate time sigs per scene + @Matt_Fletcher_2000's suggestion about having patterns of different lengths within a scene is as close as you can get. Thinking about it. You could fake it I think. For certain signatures that are divisible. So create a 4 bar clip of normal 16 step bars = 64 steps. Then just pretend that in fact it's 6 bars of 12 step bars - and fill in the grid like this (using copy and paste of your 12 step pattern). Yeah, I like that the Volcas and Live (and some other apps) make this so easy. Thanks @Matt_Fletcher_2000, it seems the uneven bars + weird time sigs is a good workaround, if focused distressingly on math? I had assumed odd numbers weren't possible because the shortcuts only give you multiples of 2... but just tried it and seems promising. So close Gadget. Just make it so these things snap to the grid rather than measures..